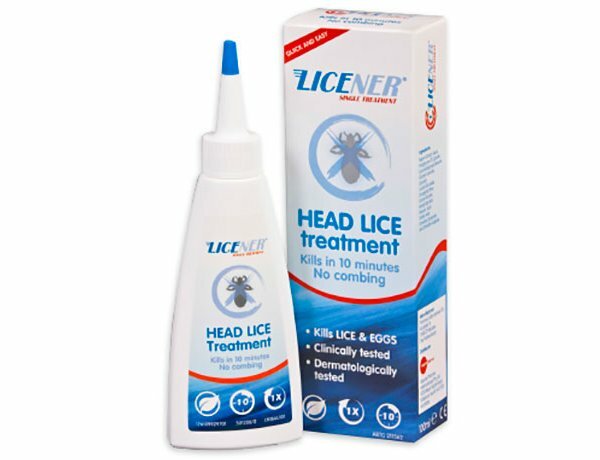 No back to school kit is complete without a fast acting head lice treatment! 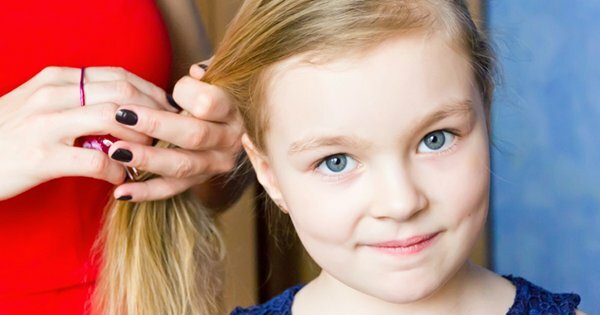 You’ve checked the list, you have the new hat, the hair ties, the head band and more hair spray than you can poke a stick at ready for the return of school, but do you have what’s often not mentioned in your school hair arsenal – an awesome, no fuss head lice treatment? Of course it goes without saying, it’s better if you don’t need it, we don’t wish these itchy critters upon anyone – but should your child fall victim to an infestation of head lice, you want to be prepared for a return attack in an instant. Traditional lice treatments have been an arduous task for both the child playing host to a party of lice and the parent who has to perform several lengthy, time sucking treatment steps and then repeat them a week or so later. But no more – nope, here we show you two awesome new brands that most definitely deserve a place in your medicine cabinet. For parents looking for a natural nit treatment, you can confidently turn to well known Australian brand Euky Bear to help. 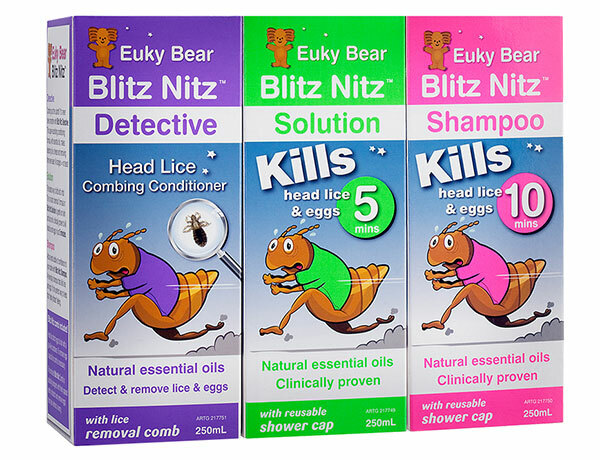 Euky Bear Blitz Nitz is a three-step head lice control program based on natural ingredients, including a special blend of essential oils such as eucalyptus and tea tree, especially chosen for their lice-killing properties. The Blitz Nitz Solution (step two) has been independently clinically tested and proven to kill both lice and eggs in just five minutes. Astounding we know! Effective blitzing is all in the timing and time poor parents can sign up for free SMS reminders to remind them they’re due to give the next treatment step. Blitz Nitz Detective is step one of the program, a simple detangling spray that stuns lice instantly in their tracks, making them super easy to comb out with the Euky Bear LED Head Lice Comb. Step two is the Blitz Nitz Solution – just five measly minutes is well spent while natural essential oils go to work in killing all head lice and eggs that have taken up home on the hair shafts. Finally in step three, rinse with Blitz Nitz Shampoo – both a lice deterrent and shampoo, it’s gentle enough for everyday use and doubles as a secondary lice treatment. The Euky Bear Blitz Nitz system is available at Priceline and leading chemists. Recently we introduced you to the dermatologically tested Licener Single Treatment, a one stop treatment in every sense of the word. Gentle on normal skin and hair, just one ten minute application is all that is required – simply cover all of your child’s hair with Licener Single Treatment shampoo for its fast acting active ingredient, neem extract, to work its magic in killing both the head lice and those pesky hair shaft-clinging eggs. After ten minutes, you simply rinse the treatment out with warm water – you don’t even have to follow it up with a regular shampoo, it’s that easy! I don’t know what’s more of a relief with Licener Single Treatment – the fact that it takes only ten minutes and is one application only or the sanity saving fact that this clever treatment requires no comb through to be effective, which is I’m sure is music to parents of thick, long and curly haired children. You can find Licener Single Treatment at many chemists around the country or buy direct from Licener – if you get a group of friends to order together you can even score yourselves a nice discount off the retail price. We wish you and your family an awesome start to the school year and hope that it remains head lice free, but if it isn’t – remember it’s best to be prepared with a fantastic time savvy, painless treatment.